The Jewish people mourns the murder this past Thursday of two IDF soldiers in the terror attack by Givat Hassaf. Yuval Mor Yosef and Yosef Cohen of the Charedi Battalion. 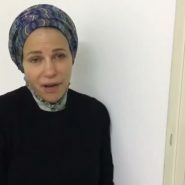 In this video, Yossi’s mother shares what her beloved son gave thanks for on his final Shabbat in this world. The young woman seriously injured in that same attack, 20-year-old, Shira Sabag, was a classmate and friend of my daughter’s (they were one class below Shira Ish Ran.) My daughter told me that Shira is a lovely, idealistic young woman who served as the youth group director (Kommunarit) of Beit El, and that she admires her greatly. Please pray for the complete and immediate recovery of Shira bat Michal as well as 2 soldiers critically injured on Thursday and Friday: Neve Michael ben Osnat Esther and Natanel Ilana be Shayna Tsiporah. Oh my G-d! Are there really people like this in the world? She is praising G-d and thanking Him for the 19 and a half years…! and this woman has been through great tragedies, her first husband died from cancer leaving her with 10 orphans (she eventually married a man who also had 10 children), and her son in law, meir chai, was murdered a few years ago in a terror attack as well.